"Congratulations and Happy New Year - you have been selected as an IBM Champion for WebSphere software! " I am stunned and amazed at this recognition, what can I say beyond thank you to the selection committee and my friends, especially Dave and Sharon, for all their technical help when Websphere got the better of me early on. Okay, it still gets the better of me, but I am more on top of it now. The official announcement is here. Looking at the list, I am more humbled, because in no way do I represent that deep technical side of Websphere some of the people represent. One can only imagine it was because my clients helped me get here. Thanks to Bob and Jorge who nominated me. 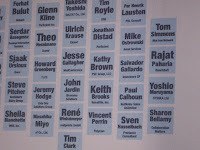 Hopefully I can make my presence in the Websphere community stronger over time with Daphne's and Justin's help. For the record I am not the first dual IBM Champion. But am the first to also be a Redbooks Thought Leader. At 11-11:30 AM this morning in the Social Cafe on the exhibition floor I will be having a session on Soloing vs. Sharing or a brief story about the process we go through from no sharing and silo's to some sharing and silo's to full open sharing...and silo's. It is an interactive discussion so if you feel trapped behind a wall of management or bewildered about why/how information is in so many places or just want to argue silo's work, come on over. This post is being written in the Dolphin hotel, where everyone in Orlando is gathered for the annual Collaboration lovefest called Connect 2013, formerly known as Lotusphere. Some people may make fun of us, they may think it is out dated, they may believe there is nothing else to do, or care about this or just don't get it. Sure I speak in a bubble that has it's own terms, acronyms and quirks like any other solution out there, but it is one which I believe in very strongly. 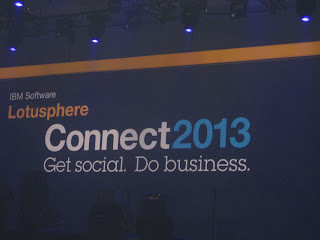 As I sit here writing this, I am listening, watching the great video the Connect 2013 team provided everyone with the history of past Lotusphere events, most of which I have attended (I hope there is some Lotusphere Europe bits in there too). 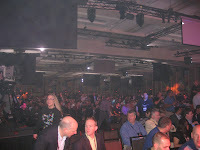 The great speakers, the executives, the cheers, the parties, the legendary "things that stay at Lotusphere", and more, that gave us great highs and few lows. Many people this year asked me if I was dropping or changing my Twitter/Skype and other monikers that use Lotusevangelist. The answer is no, it stays, and will stay for however long I continue to do what I love. There is no one pushing me to change the name, although I had thought about it this year, one of the sessions at Connect reminded me why I chose this title to leverage. The session done by my evangelist idols, Luis Suarez, Louis Richardson and Luis Benitez brought to me what is important. My brand. My world, my readers, my friends and our greater good we could create. Perhaps changing my moniker would be accepted, but that would deny what I am, what I believe and what I do. My role, so to speak, as an IBM Champion for ICS and Websphere is to be a brand ambassador. Maybe this is idea of not changing my moniker is not inline with some people, but if you Get Social and understand it, you understand that your personal brand is very important to you. You work hard to grow your social influence, but without being a thought leader or technically competent, it is luck if you get anywhere. I am not that intelligent, plenty of great speakers this week cover and covered many topics, most likely better than I. However, when you need to explain solutions and work with management that may not understand the social imperative or the open business (Luis Suarez used this line tonight) direction this will lead your company, who would you prefer to put in front of that client? Someone who not only sells it and works on it, but also uses it and leverages it across products and geographies or someone who you can't even find on Linkedin? There is nothing like IBM Domino and Notes, Sametime or Quickr out there that really does so much and in so many ways and with IBM Connections you get even more embedded into a realm that was started 20 or so years ago. None of this is new, so what does this have to do with My Brand? One becomes connected, some say too much, but I don't think so because how can you get across and truly be authentic, when your name changes everywhere each year because of what the industry analysts decide to rename so they can sell more subscriptions? Walking the halls here and people recognizing me and following me because they have that hope, the view, that I bring them hope or guidance to do what they may not have thought they could. I want open business, not partially open business. My blog is public and open, anyone can read it and search and find it easily. It brings in business and if IBM did not have an issue naming me an IBM Champion or a Redbooks thought leader, who am I to argue with what works for me. As Michael J. Fox said last year at Lotusphere 2012 on stage, "A lady gave birth in a tree, what have you got?" When I believe in something strongly enough, I encourage others to do so as well. I encourage admins to see their lives through their boss or their bosses boss. I ask developers to think about the junior devs or admins like me that are weak on development skills when they share information. I help marketing people recognize there are more people out there they never even thought would use their products. I bring a global view that crosses cultures and is not bounded by geography, sales compensation plans or personal biases. I blog because I care about tomorrow and the person working on a problem or an idea at 3 AM and they need inspiration or support. And I renew this belief every year I come to Orlando for the conference formerly known as Lotusphere that has graduated to be called Connect. So what did I learn today/yesterday at Connect? Where are we going? Why are we going there and better yet what does it mean to us all? It was announced attendance is up 10% this year and it shows, the halls are filled, the exhibition floor is very busy and everyone wants to get stuff done. Here are some nice tidbits of information, more mobile Sametime 9 is coming with HD video among other niceties. Quickr has an integration methodology to bring your Quickr info, both Domino and J2EE versions, into IBM Connections. Notes and Domino 9 Social Edition is in beta and includes the Notes browser plugin. This little bit of code allows one to use their notes databases from a browser and provide functionality developers have been looking for to interact with other devices and aspects not usually found within a Domino server. And it also lets iNotes users work with their notes links from a browser. There of course is Kenexa, IBM's recent purchase, the ability to work data to find and create a greater work force. A smarter workforce, a better place to get to as a company. Can we evolve? Time will tell, but we are in the early days of data engagement. Look for the Employee Experience Suite to appear soon from IBM. I spent 2 hours in the JumpStart on Sametime Unified Telephony listening to Chris Price explain the SUT Configuration tool and how that could speed up installations and proof of concept projects. For my role at VoiceRite this means we can bring SUT to you faster and easier. Want to know more, come down to our pedestal at C45. I did not get to any other sessions Sunday. Instead part of my afternoon was meetings and then exhibition floor time. One of my meetings was for the Team Social effort here at Connect. Our roles are to help more people understand social and find out the great things going on at the show. 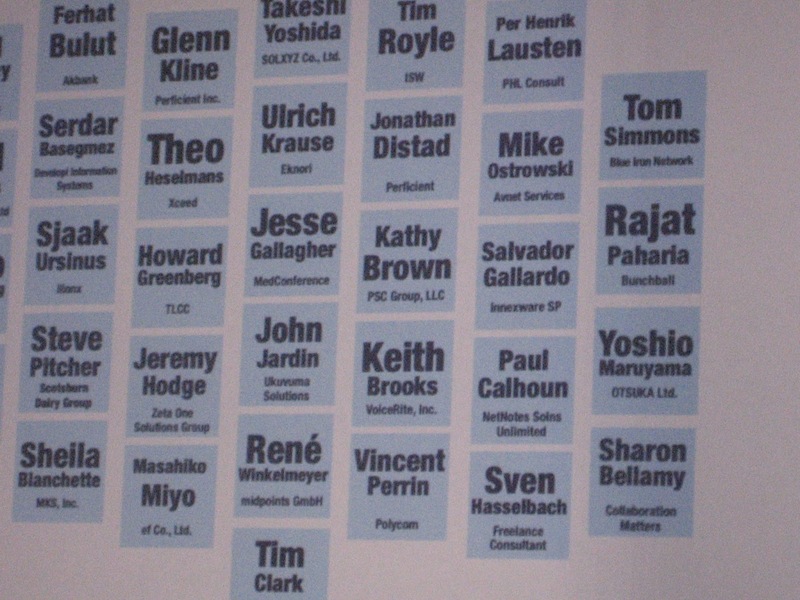 Get your picture with an IBM Champion yet and use the #IBMChamp on Twitter? That is part of it, so are The Social Cafe open discussions which run throughout the show. The other meeting was for the IBM Champions and Redbook Thought Leaders which I am proud to say I am a member of both as are a few of my friends like Femke and Salvador. We met all the new Champions and some older ones. Not easy to get 60 odd people together in one suite but we did it. 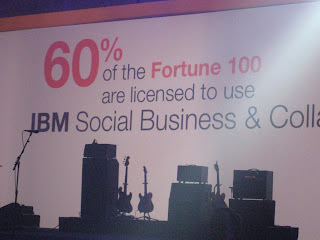 This morning at the OGS one of the screens showed this graphic and it always makes me wonder about the 40% we can grow or how to discuss with them why they did not go the IBM route. There is always something to be learned. 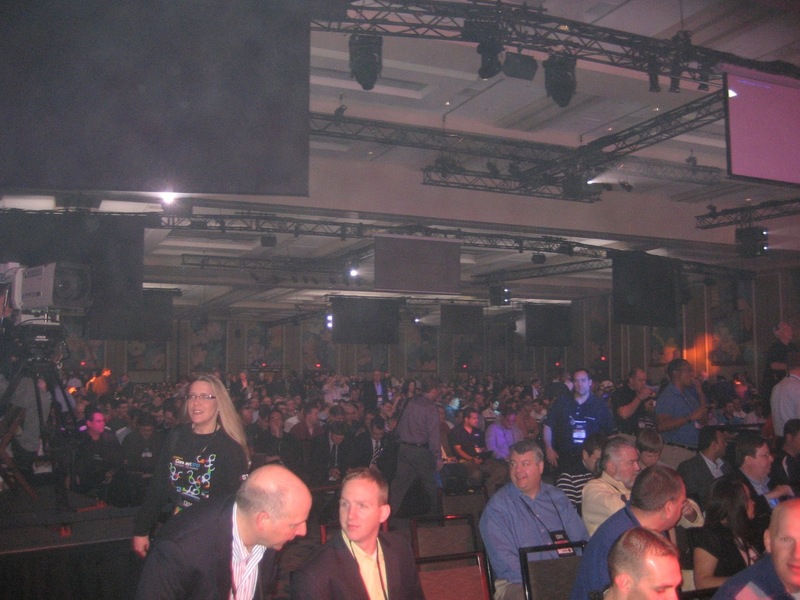 Here is the view from the Champion area in the front of the Opening General Session facing all the way back of the room. I caught Joyce in the photo and want to thank her for all her help she does for me and the other IBM Champions. A list of the Champions was on screen and of our photos but I was a bit slow to grab the photo. Others no doubt will blog the OGS better than I, I encourage you to check planetlotus.org for some of them. To all those that met me and discussed my blog or comments I have posted in places, I appreciate it immensely. As an IBMer last night said, we come here to listen and hear what everyone has to say, good and bad because that is how we get better. And so it is with my blog. Yes, I may have slowed down a bit in 2012 but I am not done yet. One goal I am trying to reach is my 1,000 post which should happen later this year. My friends in the yellowverse and you may have seen us sprawled out on the couches and chairs last night, well every night, in the Dolphin rotunda, are what makes it all worthwhile. If you do not know my fellow bloggers, tweeters or Champions, get to know us. We are here to help you and work with you. We may not always agree with the best way to solve a problem but we all are passionate about solving it, so ask away. Aside from the obvious social ways of seeing me walking around or sitting in a session, you can reach out via social media all the links are on the left side of the blog. While I am in a session I usually have Twitter up and replying. Otherwise I am on the move or in a meeting and not likely to answer that quickly. If you need me that badly, you probably know my phone numbers already. I will likely be arriving Saturday night around 11PM after driving up from Boca Raton. My focus is to work on VoiceRite business development and customer meetings and specific sessions of interest includes anything except the Developer track. In other words, if you do not find me, look for me at Pedestal C45 or leave me messages there. The pedestal is to the left when you come down the escalator to the exhibition floor. I am speaking Wen at 11-11:30 on Soloing vs Sharing, it is an interactive session and no slides. It is a Social Cafe after all. Ok, 2 slides, but they made me do it. If you want to be apart of the Social Cafe, on the exhibition floor against the far left wall when you come down the escalators) they have charging stations for laptops and phones, among other goodies. Abstract for my talk: You may like to share, but what if your boss does not? Or it's not in your company culture? Fiefdom's, silos, call them what you want but they are harder to change then you can imagine. In this open forum we will discuss both sides of the fence, and ways to encourage sharing. Sunday is Business Partner Day and I will be in some of those sessions as well as some of the Jump Starts and then I have Tweetups, Champion meetings, Social team meetings, VoiceRite meetings and of course the Beach party. Monday, OGS and then sessions, meetings, then evening events. Want to start your own blog or be a guest blogger? Find out what makes an interesting blog. Hear what works and what doesn't. 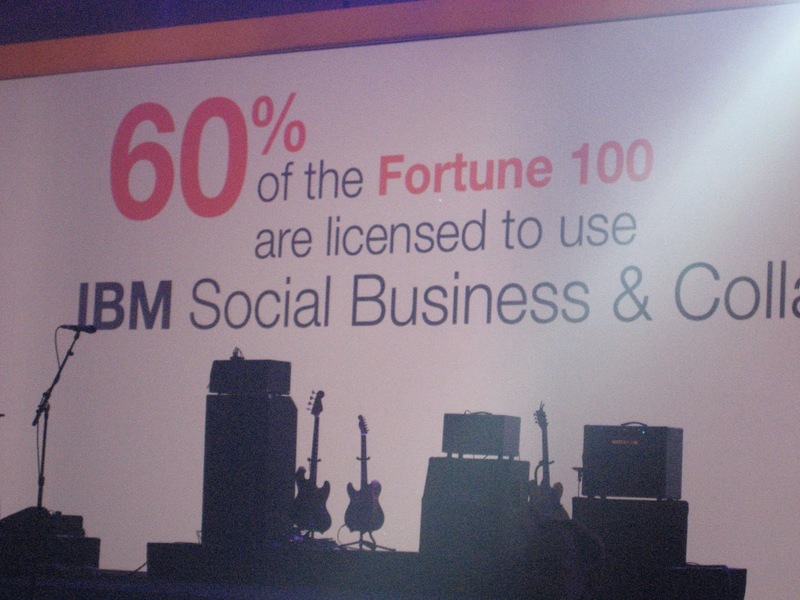 Best practices from the IBM Social Business Insights bloggers, including tips from the IBM Redbooks Thought Leaders. Wednesday same as Monday except for the Social Cafe session already discussed. Thursday I usually leave sometime after lunch so I can be home by dinner time. Hope to see everyone and if you don't see me just be social or use your social media. PS - If you see an IBM Champion, we will all have special ribbons on our badges they tell us, you should get a picture with us and post them using #IBMchamp to Twitter and include #IBMConnect. The person who gets a picture with the most Champions wins something. Also the Champion with the most attendees pictures get something. More details at the Photo Booth at the Social Cafe. There are over 70 Champions, not all of us are at the show. Sorry this got posted earlier than Friday. Oh well. Enjoy. You probably are like me and get more email than you wish. The problem is some of it is just useless, like backup reports from the tape drives. Yes I want to know about them, but no, I do not want to see them, unless there is a problem. I bet you feel the same about many of them.We see often enough that mail rules are not used by everyone. Which is a shame because it is one of the best ways to help you get to the semi-mythical inbox zero. GTD, Getting Things Done people will and rightly argue there is a better way but for the average person, mail rules can mean a big difference. I want to provide another example, aside from the backup notices above. If you are part of ANY internal distribution list, raise your hand. As I suspected, almost everyone. And hoiw often do those really involve you or have any meaning? If never is your answer, GET OFF THE LIST! Like Linkedin groups that sends you updates you never read and then you get a nice email saying they have changed you to digest or weekly, if you never read them, why do you get them. Otherwise keep reading. You can create a quick rule, but I prefer the full details. Let me show you why. Sorry forgot to tell you how to find the mail rules. One way is to click on the More drop down menu option and click on Quick Rules or Mail Rules. The other way is to click on Tools form your Left column and then Rules. You can pick any sender, domain or subject, fine by me for step 1. Pick either choice in step 2. But it is step 3 which leaves me wanting more. yes, one can change importance or not accept the message (i.e. delete it) or move to a folder. Now the problem with moving it to a folder is, you guessed it, you will not have seen the message! Not what one wants usually, unless it is the tape backup saying success, in that case, this works. Now if you are NOT a manager, this next part can be skipped. But I know you will read it anyway. As a manager of multiple international projects I am on a few distribution lists which although MOST of the emails serve no purpose for me, I get them anyway. BUT the few that are for my teams, I need to see and do something with them. Here is where the full mail rules kick in. Once at the Mail Rules window, click New Rule and you will see this screen. you can see orm the snapshot I entered support in the blank field and changed the default sender to to or cc contains. This normally would be the group address name of your distribution list. Then the drop down for Specify Actions has copy to folder and I created one called supportmails and then click Add Action and click OK. NOTE: If you leave the default as Sender you will only get copies of anything with support as the TO field. 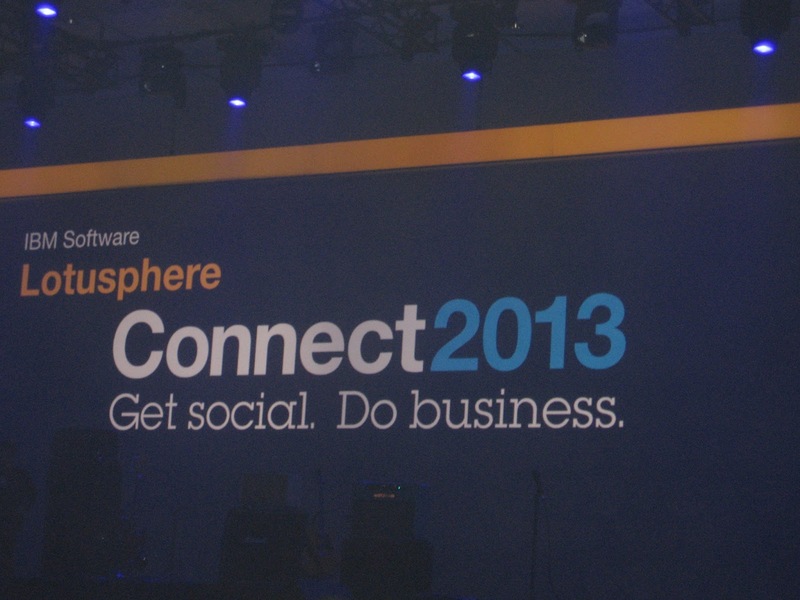 See you Sunday at Connect 2013! No more tips after this, just one more post about where I will be and how to find me. So I am going to remind everyone about the FREE and (mostly) client side benefits you have that can be installed to help you get the most out of your IBM Connections services. All of these are at the Greenhouse Catalog. But some have been updated, you do know you should update the widgets if you haven't recently? Right? Hopefully we will see some new ones during or after Connect 2013. Save chat transcripts into a Connections activity or a community forum. Business Card federates data from various sources such as the Connections Profiles, Sametime buddy list, and the Lotus Notes Directory. Links to the Connections applications are available as well as profile contact information. With the IBM® Connections Connector for Lotus® Quickr™, you can create associated Lotus Quickr team places for IBM Connections communities. A Lotus Quickr team place provides a central location from which a team can organize, share files, and collaborate on documents. Every IBM Connections community owner can optionally choose to create an associated Lotus Quickr team place. Updates made in the Lotus Quickr team place are aggregated in the community overview page, making it easier to stay current with projects and work collaboratively. Access control and membership of the Lotus Quickr place is determined by the often fluctuating IBM Connections community membership; it does not need to be managed separately. This version of the connector supports integration of Communities in IBM Connections 4.0 with Lotus Quickr 8.5.1 for WebSphere® Portal, or Lotus Quickr 8.5.1 for Lotus® Domino® 8.5. 4A) Quickr J2EE Library for Connections in case you need it too (I have not tested it, possibly needs server side help). There you go 6 widgets to help you get the most out of your Connections installation and all for FREE! Donna Bieg posted this and I wanted to make sure everyone knew about it. My session is on Wen at 11AM and I may be on a panel in between. The Social Cafe is on the exhibition floor to the left as you come down the escalator or to the right if you come in from the Lunch level. Take a break and recharge your mobile device in the Social Cafe, while listening to short informative social talks by industry leaders from TechCrunch, Deloitte Digital, Redbook Thought Leaders, customers, business partners, IBM and IBM Champions. A wide variety of social topics will be presented, including: Social enablement, collaboration, mobile apps, social networking, and community management. Stop by to discuss the value of social with Chris Heuer of Deloitte Digital and debate the future of data with TechCrunch witer, Alex Williams. You can see the full schedule below. Talks will be conducted at the social cafe in the solutions showroom, near the bookstore. Just a few more days and a whole new world will open before your eyes at Connect2013! But for now, we have to build up interest and what better interest is there than various tips for users? So far I discussed Lotus Notes letterhead and Sametime Goodies and for today I decided to discuss a Notes Calendar trick. This is helpful not just for the reasons described but if you need to do compliance work or some other similar areas. If your calendar looks like mine for next week, you may be going to Connect. What if you needed to get this on to a different mail file, say your Notes9 test site and it is not in your domain? Or in my case I want all my personal and company meetings to merge properly. Fellow IBM Champion Mat Newman outlined some examples to get an ical feed for your Notes calendar and getting Facebook birthdays and events in your Notes calendar in case you are wondering. In this case I am unable to bridge the domains and see each others mail. You may find synching to Gmail and then back to your phone works but not in my specific case. So here is how i got around it. 3) Now click File-Export from the menu bar and enter a name, I used week and make sure to select calendar file (.ics). Also put the file someplace accessible from the 2nd machine, like a network share or a dropbox account or email it to the other domain. 4) You will be asked if you want ALL your documents exported, be sure to only click Selected Documents. 5) Now swap over to your other machine or client, open your calendar view and select File-Import. locate the file and open it. 6) You will see a pop up window asking about importing into your calendar with a preview of the entries. You may choose not to use notify me, your phone or client would be going off all the time. Maybe not as much fun as the other tips, but just as useful. Everyone who uses Sametime loves it. It just works and does some great things too, when properly configured. There are some things few people ever know about so I want to highlight some and end with a few links to nice ST tools. 1) Why does every Community use the same icon? Because you never changed it. Really. You go into the Manage Sametime Community from File-Preferences-Sametime-Server Communities-CommunityName and the Icon tab and you have a prebuilt set of 5 choices or you could add a 16x16 icon same size as a favicon. you see where this could be helpful. I made those icons for you for each Community, enjoy. 2) Did you know you can check someone's calendar availability for a meeting from their sametime icon? Right click on the person and select Check Availability. How awesome is that! 2a) While there, right click and look at all the options you have, Instant meeting! Collaboration History! Wait, you never tried these? Go do it now. I'll wait. Remember to thank the Sametime team and Product managers when you see them at Connect. 2b) If you used SUT or SUTLite you would have even more options and benefits like calling the person directly. 3) Did you know Sametime has a screen capture tool built-in as well? No administrator needed to make it work, but your mileage may vary based on the installed version of Connections. You get a nice quick integration to hop to your Connections applications. 5) Got Skype? Pentos says they have a plugin for Skype usage with Sametime. Looks interesting and they provide a 10 day trial, just enough for those coming to Connect. 6) Many clients exist for android, iPhone, Macs, Linux in addition to the IBM provided client so ask around check it out. when I am doing testing I use QuipIM on my Android phone in addition to the IBM client. Lots of Sametime sessions at Connect 2013, see you there! Having finally got around to installing the public beta, as a Design Partner I have been using the previous beta code I am impressed by the speed of the client. Here are a few simple yet beneficial bits of information. It moves much more fluidly than the 8.5.x stream. More web speed than Windows speed. There is now a Discover tab area which is sort of like a GUI for help and a welcome to Notes on line learning area. Right now the video links are not connected but a number of useful items from mailing, search, calendar and more will be there for all the new users and even find some new pieces for us old guys. The IBM Connections plugins and widgets all work in the beta so far as well. Also under Show is the new Beginning of Message option will show you just what it says, the beginning of the messages. If you are not a fan of the shades of grey look, change the theme. I set it to my Operating System Theme for my Windows7 laptop. Steps from your Notes client: File->Preferences->Windows and Themes and the Theme option drop down. The other thing I changed is the new blue icon. I don't mind the change, but since my background is blue as well it blends in and I miss my yellow/orange icon. So with that in mind I created a Lotus icon so I did not need the old notes.exe which housed it. If you want a copy, grab it here it is also on my Downloads tab. I made this using this site in case you wanted any other icons. No doubt much more will come out in time as I use it further.